Rugby isn’t a game where you have bundles of time to think, so getting your players to make more informed decisions quicker will only help improve the success of the team. Having the ability to recognise the weakness in the opposition and when you need to support the play keep attacks going to help build sustained pressure. Learn how to nail it in the session. 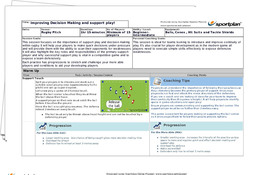 Throughout the session, the main target is to improve decision making to help support play. From the warm-up, the theme begins, getting the players minds alive for the session with a game of touch with the emphasis on supporting the play. As the session progresses, introduce the idea of the ‘Magic Space’ which players should be attacking if they are properly supporting the play. By nailling the idea of this space, players will not stop wanting to get there to take advantage of the benefits. 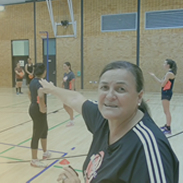 Introducing these practices allows the players to develop an understanding of where their teammates will be in support, breeding a confidence in one another to attack with freedom. Finish off the session with a full contact practice to help players put into practice everything they’ve worked on over the session. Get your players recognising that by supporting the play, it’s likely they will get the ball at their hands as the phases go on, creating a huge opportunity to go on a score.